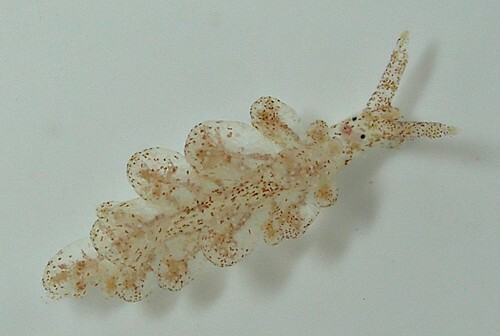 Identification: This is a nearly transparent animal flecked with cream and light brown. Olive-brown branches of the digestive gland show through the cerata. There is usually a red-brown patch behind the eye spots on the left side of the head and the rhinophores have tapered tips. Natural history: Hermaea sp. #1 is a moderately common species found at protected to moderately exposed rocky sites and in Halimeda kanaloana beds at depths of < 1 to 11 m (< 3 to 36 ft). It is most numerous in protected, back-reef habitats where it can be found, often in large numbers, in patches of a small, plumose red alga (Wrangelia dumontii). (Note 1) We've observed it feeding on that alga in dishes. It shows a diurnal activity pattern when held and lays a white, arc-shaped egg mass (usually on its host alga). The eggs hatch in about three days in the laboratory. Distribution: Maui, Kauai and Midway. Taxonomic notes: This animal is listed as "Stiliger sp. 7" in Gosliner, et. al., 2008. It was first recorded in Hawaii from Hekili Point, Maui by CP on Aug. 3, 1991. Gosliner et. al. 2018 uses "Ercolania sp." for this animal. So, there's some chance that it (and other similar-appearing species from elsewhere) that are currently included in Hermaea might be moved to that genus. Photo: CP: 4 mm: Mala Wharf, Maui; Dec, 9, 2004. Note 1: There's some chance this algae may be Wrangelia elegantissima, instead.